Pipettes are laboratory tools that are used to draw up and dispense a consistent and reproduce-able volume of liquid. For generations, pipettes have been based on a simple design that allows the user to manually set the desired volume, usually by rotating the pipette plunger, and then aspirating and dispensing liquids through the application of force on the central plunger. Lab pipettes can either use an air-displacement or positive displacement mechanism, each offering different advantages depending on the type of solutions to be pipetted. The pipette can be built to work with just a single volume (often called a fixed-volume pipette) or adjustable within a particular range (an adjustable-volume pipette). Multichannel pipettes are designed for HTS (high-throughput screening) work common in drug discovery and assay plate preparation. 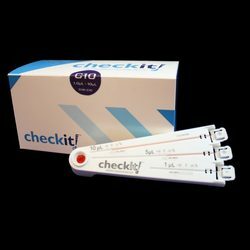 Available in eight or twelve channel options, these reduce the amount of steps required to prepare a sample and significantly cut down on the incidence of repetitive stress injury that is a common hazard with pipetting. Lately, more and more manufacturers are developing highly precise and accurate electronic pipettes that incorporate desirable features to reduce hand strain which is common where extensive pipetting occurs. Look for our variety of manual and electronic pipettes, including the truly unique Ovation ergonomic pipette from Vista Lab. Stellar Scientific offers single channel, multichannel, electronic and repeating pipettes from manufacturers with a collective eighty-plus years experience in liquid handling. With the exception of Vista Lab Ovation pipettes, all of the single and multichannel pipettes available from Stellar Scientific have been tested and approved to be compatible with our excellent low-retention Teepa Tip universal pipette tips. For the best results when using a multi-channel pipette, we recommend pairing them with the unique One-Touch tip that are now available in sizes from 3uL to 1000uL. Check out the free calibration tools available at our friends at Calibrate.it for tips and techniques on over one thousand different lab pipettes.